One of the more frustrating parts about moving house is having to pack up all of your stuff. This is especially true if you have been at your current location for five years or more. No matter how much we throw away or go through things that we don’t need anymore, we tend to accumulate lots of stuff whenever we stay still for any length of time. But Rhode Island movers should not dismay, for we have some helpful tips for you about residential moving and storage from the professionals at Conlon Moving & Storage. One last thing before diving into these tips – if you are really overwhelmed at the idea of packing up your home to move, you can hire a team of professional packers from your residential moving company to take care of it for you. They will come to your home, take an assessment of what you have, what needs to be packed and how much time it will take. They can give you an estimate along with the cost for making household moves in Rhode Island so you can determine whether it is worth it for you at this time. You can choose how much or how little gets packed by the pros and what, if anything, gets left behind to be packed by you and your family. Contact Conlon Moving & Storage to get a FREE estimate on your next move and make sure to ask about our professional packing services. When it comes time to make your move, there are a few tips that will help make your move so much easier. When you work with Rhode Island movers, you can gain access to some of the industry’s top quality boxes, tape and moving supplies. You also gain the experience and knowledge of experts in residential moving and storage, who can help you to pack your things safely and securely, whether you are moving just a couple of towns over or if you are moving across the Atlantic Ocean. It pays to work with an experienced residential moving company for any type of household moves that you make in Rhode Island, Massachusetts, Connecticut or anywhere in the New England area. Make sure to ask about getting moving supplies through Conlon Moving & Storage – or, if you are interested in having the professional team of packers do it for you, find out what type of boxes they will be bringing to your home. Boxes can be difficult – especially if you have unique or fragile items. If you will be doing your own packing or even if you will be hiring a pro, it is a good idea to have kept all of your electronics boxes, such as flat screen televisions, computer monitors and other large, odd-shaped items. If you do not have the original boxes, as many homeowners do not, consider looking online for tips and videos on how to pack these unusually sized objects. You could even just consult with the residential moving company on the hard-to-pack items, as they will want to make sure that they are properly packed as well in order to insure them for your move. Make sure that all electronics boxes are properly sealed with a durable, high quality packing tape to ensure that no dust, dirt or debris makes its way into the package where it could damage expensive equipment. A lot of people put all the focus on getting the right type of boxes for household moves in Rhode Island, but totally forget about all the other supplies that they will need. 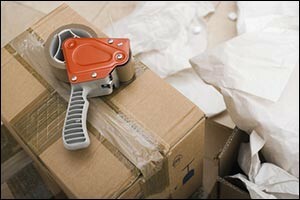 From properly sealing the boxes to packing fragile items carefully so they won’t break, there are a lot of unique supplies that are now available through your Rhode Island movers that you can use to protect your things during packing, loading, storage, unloading and unpacking. One of the best tips ever is to start packing your things right away. Create four distinct piles in each room that you pack – 1) pack – for items that you are going to pack for the move; 2) store – for items that you are going to put into storage, either before the move occurs or to store because you won’t have room or need of the item at the new place; 3) toss – things that you will no longer need that are broken and useless; 4) recycle and donate – things that can either be recycled to reduce your contribution to the local landfill or things that could be donated to Goodwill or another local charity. Ideally you should start going through your things like this about two months before you move to give you time to get it all done. You may need more of less time, depending on the size of your home and the amount of stuff that you have collected. Again, remember that you can pack up specific items that mean something special to you, and then have your residential moving company come in and pack all of the generic items that you use each and every day, such as dishes, pots and pans, clothing, bedding, books, etc. Create a moving plan with your residential moving and storage company that works with you and your schedule. With over 125 years of continuous service, providing commercial and residential moving and storage to the people of Southeastern Massachusetts and the surrounding area, Conlon Moving & Storage can help you with local moves, interstate moves and international moving services to lighten the load of your relocation. Give us a call at 508-336-7766 to find out more about our services or to schedule an appointment for a FREE in-home estimate on any household moves in Rhode Island, Connecticut, Southeastern Massachusetts and beyond. Call today and find out why so many locals trust Conlon Moving & Storage as their number one Rhode Island movers.